Nappy Fresh: 5-15%: Sodium Carbonate, Sodium Percarbonate, Organic Sequestering Agent. Below 5%: Anionic Surfactant, Cellulose Colloids. bioD Detergent: 15-30%: Zeolite, Soda Ash. 5-15%: Sodium Metasilicate, Sodium Percarbonate. Below5%: Anionic Surfactant, Vegetable Soap, Cellulose Colloids. 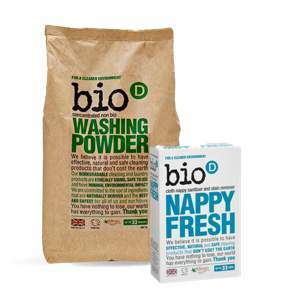 Use 15g (one tablespoon) Nappy Fresh to your usual amount of detergent (approx. 50g). Both suitable for machine or handwash and work well even at low temperatures. These products are free from phosphates, E.D.T.A., enzymes, optical brighteners, chlorine bleach, animal derivatives and petroleum-derived additives.